Books | I am JuJu! I am so excited about this stack of books! My husband and I each took a bit out of our income tax return to spend on whatever we wanted. He chose to renew his MLB.com subscription so he can watch live streaming of baseball games and I, of course, spent my money on books! I wrote HERE about my goals for 2014, which included reading a book each week. I also mentioned that I want to read 4 books on marriage as part of my marriage goals for the year. 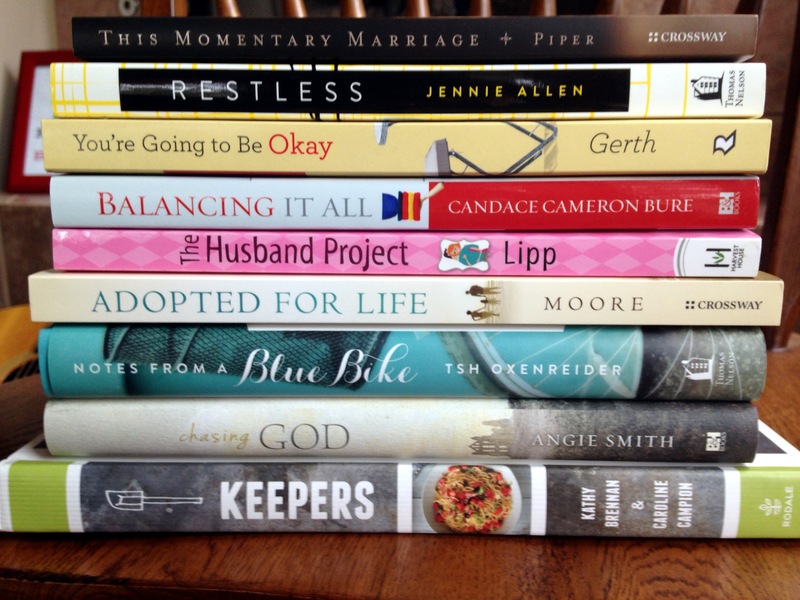 This Momentary Marriage and The Husband Project are the first 2 books on that list. Although I have a fantastic relationship with my spouse, I am looking forward to focusing on being intentional about fostering that relationship. As you may have noticed, I have several books that have a common theme: balance & living simply. I have been walking through an extremely restless season for the past few months, and unfortunately, the next six months will be even more crazy. We are moving to Boston at the end of the summer and recently found out that we have to move out of our home 10 weeks before that move. It’s like having a serving of hectic with a side of chaos! Because of this, I have chosen several books to help keep me centered & focused. Balancing it All, You’re Going to Be Okay, and Notes From a Blue Bike are all books I am really looking forward to reading during this season. I also picked up Jennie Allen’s new book, Restless. I absolutely adore Jennie’s heart for women to grow in their relationships with God. I share that same desire, so it is no surprise that I feel so at home in her writing. I read Anything last year and it was fantastically life-changing! Chasing God by Angie Smith also promises to be equally amazing! I hope to share more of my thoughts about these books here on my blog once I’ve read them. If you’d like to see what I’ve read so far this year and you have a Goodreads account, you can follow me. My account name is: Julie Coryell. What are you reading these days? I’d love to hear! The above books are the physical books that I am hoping to devour in the next two months. I also have books, e-books, and audiobooks on my Kindle. I’ll share those titles with you another day. This collection of books includes an autobiography, a couple of fiction novels, and books on Christianity, healthy living, autism, reading/homeschooling, building relationships, and one just laugh out loud book of silliness! A couple of the books, Nourishing Traditions and Secrets to a Healthy Metabolism, are books I read and re-read. I consider them healthy eating reference guides. They are packed full of lots of great information, but sometimes sitting down and trying to digest too much in one sitting gives me a headache! I am currently reading Anything by Jennie Allen as part of an on-line Bible study that I’m doing through Good Morning Girls. I had already purchased it and then found out about the study. It is about fully surrendering your life to God. Truly being open to ANYTHING He might have for you. It has stretched me more than I ever thought possible! So exciting! Jennie talks about Kisses from Katie in the book so I am reading that simultaneously as we only cover a few chapters a week in our study. My sister also read Kisses from Katie and said it was phenomenal! 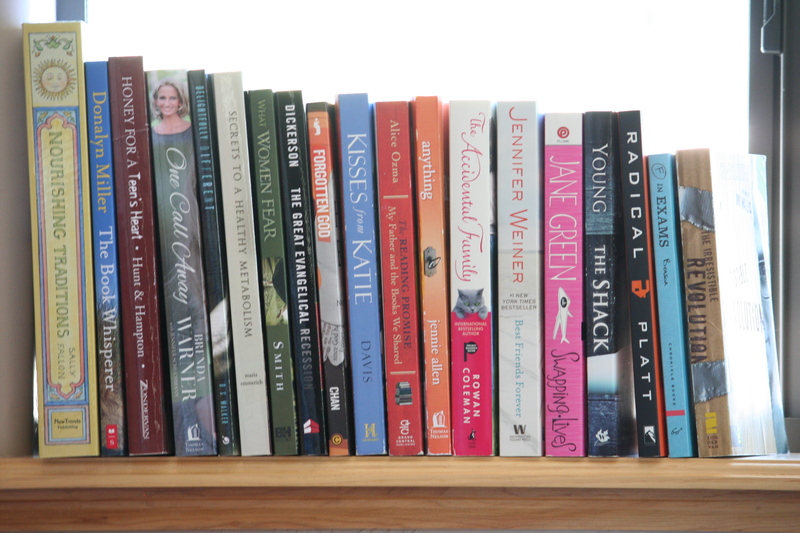 Here is a complete list of the books that are on my bookshelf to read this summer. I broke them down by category. One Call Away by Brenda Warner (wife of former NFL quaterback Kurt Warner) : this probably could have gone in the Christian category as both Steve and Brenda are Christians who are very open to share how Jesus radically changed their lives! So there is my list! Have you read any of these books? I’d love to hear your thoughts on any of them! I’d also love to hear what you are currently reading and if there are any titles that you think are a must-read this summer! You can leave them in the comments!